However, this is not unexpected, given that the US may not accept that one of its cutting-edge F-16s was brought down by a vintage Russian MiG-21 Bison of the Indian Air Force. India has also maintained that it has enough evidence to confirm that an F-16 was indeed shot down. But there is another aspect to the story that has not been highlighted: Pakistan’s own manipulation of the F-16 inventory. ThePrint tries to throw some light on this. In February 2014, Pakistan had signed a deal with Jordan to purchase 13 F-16 aircraft, of which 12 were ‘A’ models and one was the ‘B’ model. 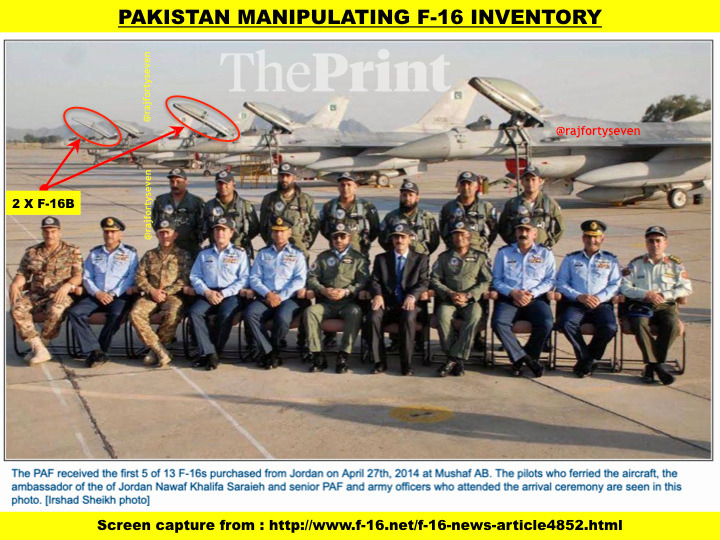 When the first batch of aircraft from Jordan was delivered to the PAF at Mushaf Air Base in Sargodha on 27 April 2014, a photograph of the ceremony was released to the press. The picture showed five F-16 aircraft, but the models were not as per the inventory quoted by the Director General of Inter-Services Public Relations, the Pakistani military’s publicity wing and the entire Pakistani media. In fact, there were three F-16 As and two F-16 Bs. The difference between the A and B variants is that the A is a single-seater while the B is a twin-seater. The F-16 A has a bubble canopy which reduces the RCS (radar cross section) by 15 per cent overall. The F-16 B has a canopy with bracing which increases the RCS. The picture of 27 April 2014 at Sargodha shows clearly visible elongated canopy and braces on two F-16 aircraft parked behind the dignitaries. The actual deal, reports say, was for 14 aircraft, with two ‘B’ models and 12 ‘A’ models. Thus, the PAF had an additional F-16B, received from RJAF, in its inventory. That’s why today, it would be possible for Pakistan to claim that all its F-16 aircraft are accounted for. The Pakistan government had requested the US government for the sale of F-16 Block 52 aircraft, which was approved by the Defence Security Cooperation Agency two years after the deal with Jordan, in February 2016. The agency indicated that eight aircraft would be sold to Pakistan — two ‘C’ models and six ‘D’ models. However, John Kerry, the US Secretary of State at the time, called off the deal, expressing concerns that Pakistan was “insufficiently targeting militant groups hostile to the United States, specifically the Haqqani Network”. Pakistan’s defence secretary Lt Gen. (retd) Muhammad Alam Khattak defiantly told the Senate’s standing committees on defence and foreign affairs that the country would buy the aircraft from the Royal Jordanian Air Force (RJAF). Pakistan was trying to put pressure on the US government by citing the earlier F-16 deal with RJAF. However, there was no further news of either deal.